With the innumerable amounts of Groupon-like offers out there on the web, one deal really caught our eye a few weeks ago. 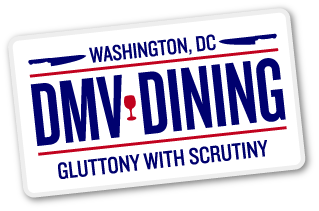 Bloomspot, one of the newer entrants in the daily deal market, offered a three-course tasting menu, with wine pairings no less, at Bethesda’s Redwood Restaurant and Bar. How much, you ask? $38! I mean, how could we resist? This past Monday, we met up with our friends Erika and Jeremy for dinner at Redwood, marking our first official dinner at the Bethesda Row venue after several happy hours and lunches. They had each bought the BloomSpot offer as well as the whole table had to participate in order to enjoy the tasting menu. We asked to sit outside, since it was a perfect night that felt like summer even though its mid-April. As we were being seated, we informed our waiter that we would be participating in the Bloomspot offer. Without hesitation, he brought over the specialized menus as well as breaking down the wine pairings for our meal. 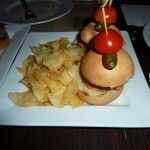 The prix-fixe menu was not as limited as we thought it would be, giving diners four to five choices per course. 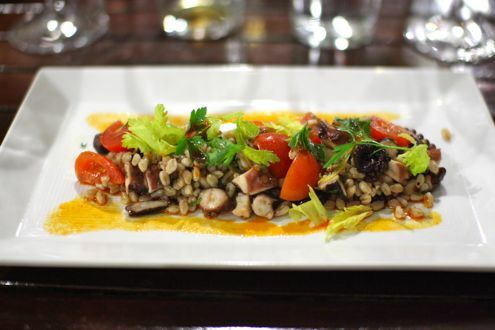 Rachel and I both ordered the grilled octopus salad for our first course. Featuring farro, fresh herbs, cherry tomatoes, lemon, and paprika vinaigrette, it was a light yet satisfying salad. I especially liked how much octopus was found on the plate, and while the protein itself wasn’t anything exceptional, the other ingredients significantly helped out. All four of us also received a glass of Pinot Grigio with our first course. What we really liked, however, were the generous pours. We must have received at least eight ounces in each of our glasses! Considering that I already had a few drafts at the bar earlier in the evening, I could tell that I was going to be in for a long evening. For our main course, I ordered the Coq au Vin. 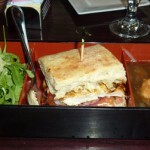 When it arrived, I was stunned not only by its beautiful presentation, but also by the sheer size of the chicken breast. 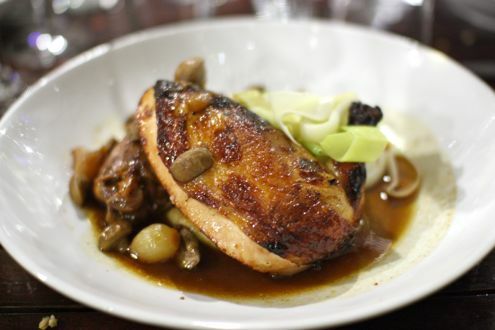 Furthermore, the dish also came with a braised thigh as well as a side of potato puree. This was a lot of food, kids. It’s sometimes difficult to pull off chicken, but this bird was excellently cooked – juicy and tender with some great flavor. 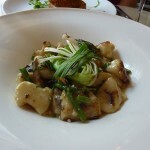 Topped with pearl onions and, even better, bacon lardoons, Redwood won me over with this entrée. I was the last of our group to finish given the immense amount of meat that was served. Not that I was complaining. 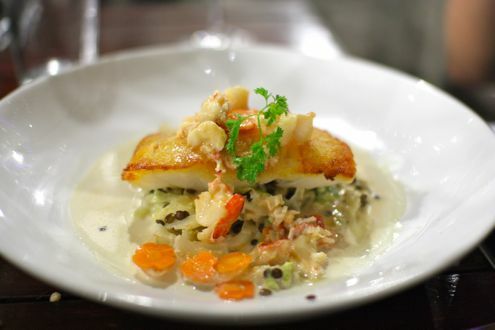 Rachel went for the pan-roasted Atlantic cod without hesitation, which came with beluga lentils, Savoy cabbage, caraway carrots, and a lobster-Riesling nage. The fish was impeccably cooked, crispy on the outside and flaky on the inside. She’s a sucker for anything with lobster, and the small nuggets in the white wine sauce melted in her mouth. Not to be outdone, our second wine paring was a superb Chardonnay from Barboursville Vineyards. And once again, our glasses were more than half full. Our whole party couldn’t believe what a deal this was as everyone was very pleased with their meal thus far. More importantly, it was also a good thing we weren’t driving! 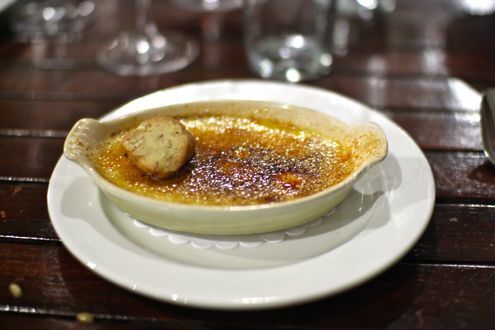 For dessert, I went with the vanilla crème brûlée. Topped with pecan sandies, it proved to be a gratifying ending to a wonderful dinner. It was a classic dish that was wonderfully executed. Rachel got the lime and yogurt Panna Cotta with a chilled mango papaya soup. 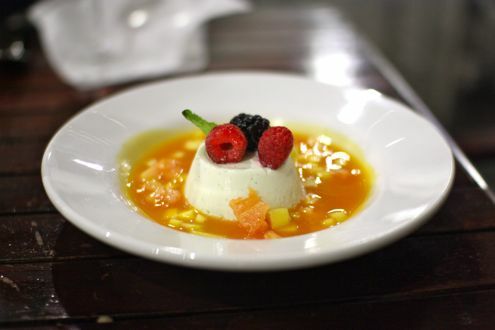 The Panna Cotta was very refreshing and perfect for a warm evening, but she could have done without the soup. The mango pieces were good but the soup was a little too overpowering for the rest of her dish. Our final wine pairing was Graham’s Six Grapes Reserve Port. While I’m not particularly the biggest fan of ports, Erika made sure she enjoyed her entire glass. I was more than satisfied considering how much I had already consumed. Overall, I still cannot believe we only paid $38 per person for a three course dinner WITH wine pairings. My meal by itself would have cost $41 a la carte, and that’s not even including a glass of wine, let alone three! The service was also exceptional as our waiter Sam was very accommodating as well as a bit of a jokester. He’s obviously in the right line of work as we left him a generous trip for his excellent service. 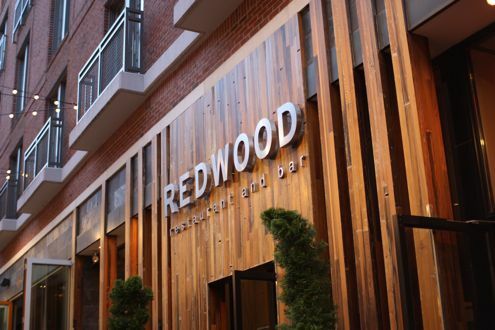 Redwood has really turned things around since they first opened and is proving that, while newer than some of Bethesda’s other restaurants, they are gradually making a name for themselves.